We looked after the cared for…. Our first Carers Relaxation Day was much enjoyed by carers who were able to have some well deserved time to do the things they can’t usually manage to do in their normal daily routine. This event was free of charge for people who care for their partners or relatives at home in the community. The aim of the day was that we looked after the cared for whilst the carers enjoyed some quality time being pampered, reading the paper, watching a film or just doing things they don’t usually get to enjoy. 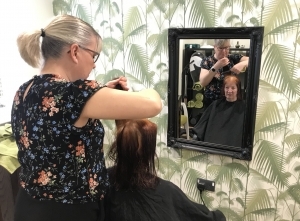 There was a hairdresser, podiatrist and physiotherapist available to provide treatments during the day or carers could simply sit in the bright sunny lounge and read newspapers and magazines, watch the television or a film and just relax! Tea and coffee was always available and carers were served a delicious home cooked 2-course lunch. Whilst the carers relaxed, our wonderful team of carers took care of their loved ones for the day. They sat with our residents and members of the team, joined in with our morning and afternoon activities and played games. At lunch time they joined our residents in the dining room for a hearty lunch. On arrival, we sat with each carer and those they care for and wrote a brief care plan so that all the staff understood their likes and dislikes, life events, medical history, medications and allergies. It’s lovely to have some quality time just for me! One of the carers who enjoyed the day was Pat. Pat is the full time carer for her husband and father in law who both have dementia and, much as she loves them, sometimes it’s a treat to be able to have some time to do the things she wants to do. Pat said. ”It’s lovely to have some pamper time for me without worrying about the two gentleman that I look after. I’ve had my nails done and a wonderful foot massage and a hair cut – it’s been absolutely wonderful!”. The next Carers Relaxation Day will take place in National Care Week on Tuesday 11th June from 10am – 4pm. To find out more or to register to attend, call 01865 558413 or email care@fairfieldhome.co.uk.